The La Sportiva TX2 is a super lightweight approach shoe designed for scrambling and climbing. 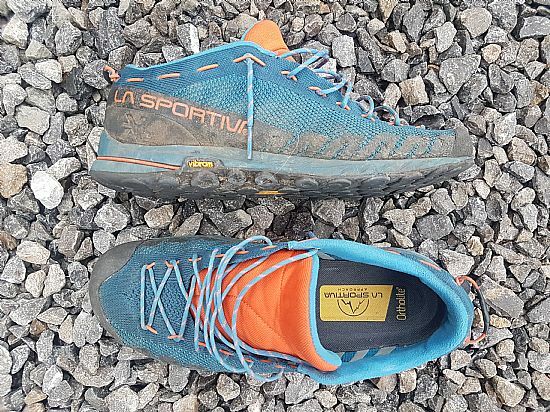 La Sportiva are absolutely right when they say that the TX2 combines the comfort of a trail running shoe to the technical characteristics of a climbing shoe. 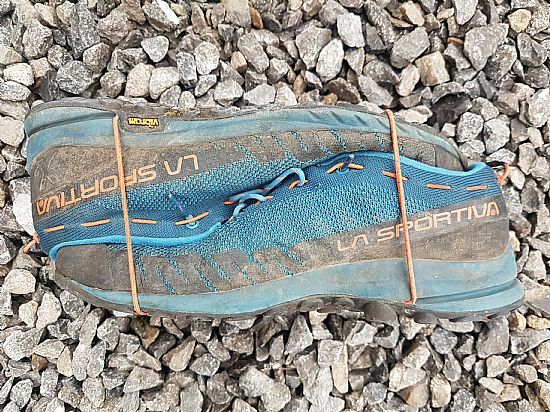 Normally I would wait until the end of the review before providing a final verdict, however in the case of the La Sportiva TX2 I’ll cut straight to the chase and say they are brilliant. Perhaps what strikes you first with the La Sportiva TX2 is just how lightweight they are. They would even give a lot of lightweight trail running shoes a run for their money as far as weight goes. This lack of weight is perhaps most appreciated when multi-pitch climbing where your shoes are quite often clipped to the back of your harness. I’m not suggesting the weight of the shoes goes unnoticed but you will almost certainly appreciate just how light they are. As well as being lightweight whilst carrying them on your harness they are also super easy to clip and store on your harness, thanks to the C2 Combo Cord system (see pictures below). The cord is in a vulnerable position and will undoubtedly perish at the worst possible time (I’m thinking sea cliff climbing, watching your shoe disappear in to the water). But when the La Sportiva TX2 isn’t dangling on the back of your harness they make excellent approach shoes. They climb incredibly well, almost as well as some of my comfortable climbing shoes. They feel great for smearing but are perhaps a touch soft for real edging performance. I’ve worn mine on things like Tower Ridge on Ben Nevis (in summer conditions), the sort of terrain where they really excel. I wouldn’t wear them for full days in the hills (ankle protection and some more support from boots would be preferential) but for scrambling and easy climbing they really are exceptional. A few very minor points of criticism; firstly the knitted upper is very breathable and comfortable but it is worth noting that these are not the shoes to wear on wet or damp approaches. 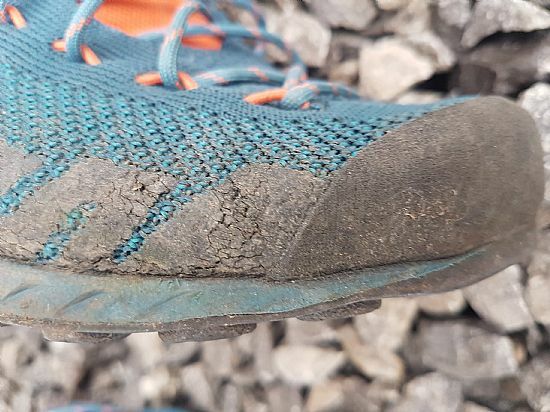 Furthermore where the knitted upper meets the rand at the front of the shoe (around where your little toe is) is a real weak spot for durability as it is easily abraded. If durability is a greater concern than being lightweight then the TX4 may be a better choice. The soles of the La Sportiva TX2 use a Vibram MegaGrip Sole with a climbing zone (essentially the smooth area at the front of the shoe). This is one of reasons the TX2 climb so well, they have a lot of surface area to provide good friction. The soles also have what La Sportiva calls “suction pads” however in reality these are the tread pattern. 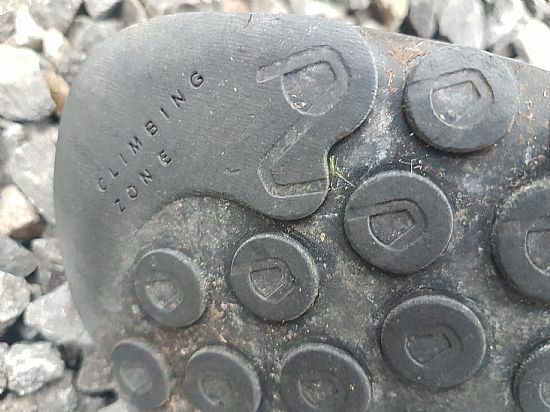 A word of warning, this tread pattern is only a few millimetres deep and wears down quite quickly, so these aren’t the shoes for everyday use (unless you only want them to last a few months). I’ll not comment too much on fit as everyone’s feet and their perception of their feet seems to differ from person to person (I’ve heard people describe their feet as really wide when in reality they are actually quite narrow). However it is worth noting that the La Sportiva TX2 (and also the TX4) shoes have a high ankle cuff, this unfortunately has a tendency to create a bad pressure point on the outside of the ankle (this is something I’ve never experienced with any other approach shoes, trail running shoes or boots). As I mentioned at the start of the review, in summary the La Sportiva TX2 are brilliant. I’ve used lots of other climbing oriented approach shoes (for example the La Sportiva Boulder X, La Sportiva Ganda and Scarpa Quest) and I really feel that the TX2 is my favourite of them all. Method of attaching them on to your harness is really innovative. They climb really well and in comfort. Minimal tread pattern wears down quickly. No waterproof protection (although this comes with the added benefit of extra breathability). Weak spot for durability where the woven upper meets the rand at the front of the shoe. As previously mentioned the La Sportiva TX2 are just brilliant. If you often need to move quickly with confidence over rocky terrain then they are fantastic. But if you need some added durability (with a weight penalty) then the TX4 may be a better choice.